First I went to Fabricland. 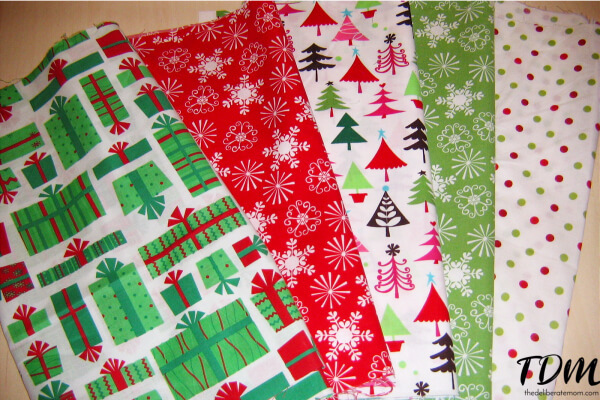 I purchased an assortment of Christmas patterned fabrics. I went with a really “retro” look for the fabrics and tried to coordinate the overall appearance of the chain. Perhaps I overthought this step. Oh well! I analyzed the pictures from Etsy and decided that my sewing machine would not be able to plough through the heavy-duty backing material. So I had to come up with my own creative solution. 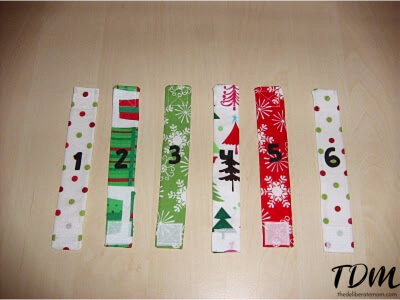 Cut rectangular pieces of each fabric (approximately 8 1/2″ long by 1 1/4″ wide). Fold them in half (lengthwise). 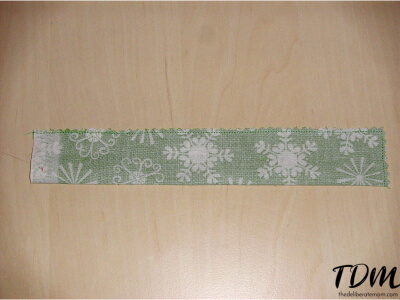 Iron them flat and then sew two of the three open sides. Use pinking shears to trim around the sewed edges. 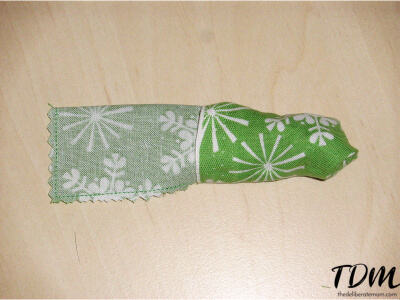 Carefully turn the fabric so that the right side faces out. This step has to be done carefully so as not to accidentally tear the seams. 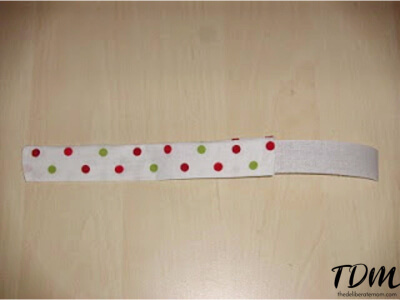 After turning the fabric rectangle with the right-side out, iron the fabric once again and insert a piece of iron-on binding material. Iron the rectangle once more. 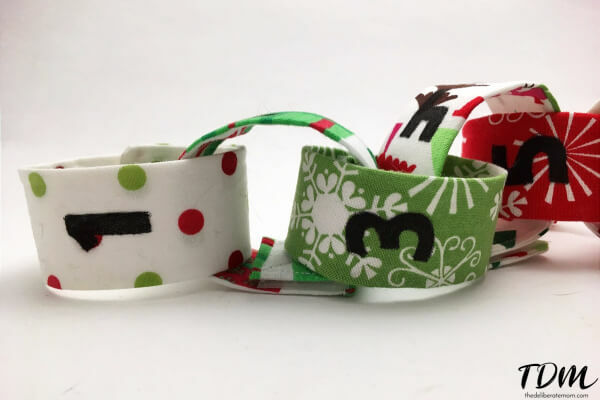 The binding material gives the chain the weight it needs to form a solid loop. The next step is the tricky part. Fold the unfinished end into itself and sewed it closed. Afterwards, sew on hook and loop fabric (Velcro) on both ends of the rectangle (the “hook” square on one side and one end of the fabric and the “loop” square on the alternate side and opposing end of the fabric). The greatest struggle was to figure out how to do the numbering on the chains. The iron-on transfers did not fit the width of my chain. I was concerned stickers would not last, so I ended up writing my own numbers with a fabric marker. Good penmanship is a MUST for this step! I admit, it took a bit of time to do the first six pieces of this chain, but I increased in speed and efficiency with every piece I made. 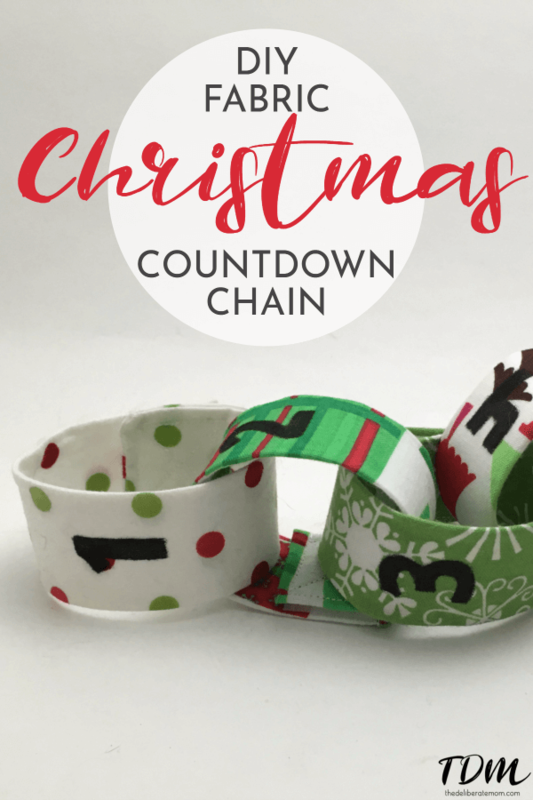 This fabric Christmas countdown chain is a treasured part of our Christmas traditions. If you follow these steps, you can have one of your own as well! Thanks for your comment Cate! I follow your blog closely, you are one busy lady… so you’re “allowed” to abandon your advent calendar idea this year! Now you have oodles of time to work on one for next year!